Relatient poised for explosive growth afforded by new venture capital and seasoned investors. Company's top leadership ready to execute on aggressive growth plan for 2014 and beyond. 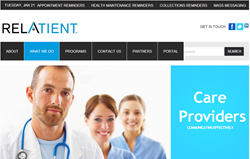 Relatient, LLC a healthcare software and services company, announced today that the company has received an undisclosed amount in its first round of venture capital financing. The financing was led by Jim Sohr, formerly President of AIM Healthcare. Jim is a respected early-stage investor with deep domain experience in healthcare technology and services. The financing also included participation by two other investors. The first is an undisclosed private, Nashville-based HCIT investor and the second is Nashville's serial entrepreneur, Joe Storey. Most recently, Joe was an EVP at WebMedx, which acquired his second successful company. The new funding will enable the company to expand the sales force, accelerate the product roadmap, and maintain excellence in support services as Relatient is experiencing rapid growth serving medical practices, hospitals, employers, and ACOs. Relatient's Co-founder, Sam Johnson, has been named President and CEO. Jim Sohr will join Mr. Johnson on the board of directors. Co-Founder, Kevin Montgomery, will continue to lead the software development efforts. Sam also highlights, "We will remain, at our core, a customer-focused organization. There is nothing more important than getting it right for the end users. I have seen organizations say that in public, then I have seen those that perform like they believe it. We will execute on customer satisfaction from every point within the organization." About RELATIENT: Relatient was founded on the realization that healthcare cost reduction will come in the form of better communication around compliance initiatives from the providers caring for their local patient population. That goal gets accomplished best by making the dialog more efficient, integrated, and automated, all while remaining fully custom to the provider’s unique preferences. Relatient is first in the marketplace to fill a system-agnostic need for integration with EHR data while remaining affordable for all sizes of health organizations with a low, fixed-priced, per-provider subscription pricing. For more information: http://www.Relatient.net or contact the organization at sales(at)relatient(dot)net.